Synopsis: An American newcomer to a prestigious German ballet academy comes to realize that the school is a front for something sinister amid a series of grisly murders. Review: Few movies considered classics can truly live up to their reputation and I think it’s especially hard for horror movies to hold up as the years go by. Audiences have become too desensitized to extreme violence, cheap scares, and ‘gotcha’ twists that looking back on what was once considered cutting edge becomes increasingly difficult. I’ll admit that re-watching director Dario Argento’s Suspiria I was keenly aware of all the moments that someone experiencing it for the first time might roll their eyes or check their watch. This is a movie that favors art over substance and atmosphere over narrative, possibly making it a rough sit for those looking for a traditionally structured fright flick. However, if you can settle in and let Argento’s most celebrated picture work its magic on you, you’re going to get a huge reward. By the time Suspiria was released, its director was already well known in the film world for his lavishly ornate visions of horror. In films like Deep Red and The Bird with the Crystal Plumage, Argento had created a calling card of sorts for the look and feel of his films. Focusing on production design and complicated camera angles that often played a part in furthering the central mystery of his bloody thrillers, Argento’s films were unpredictable and quickly moved him to the top of the list of giallo filmmakers. 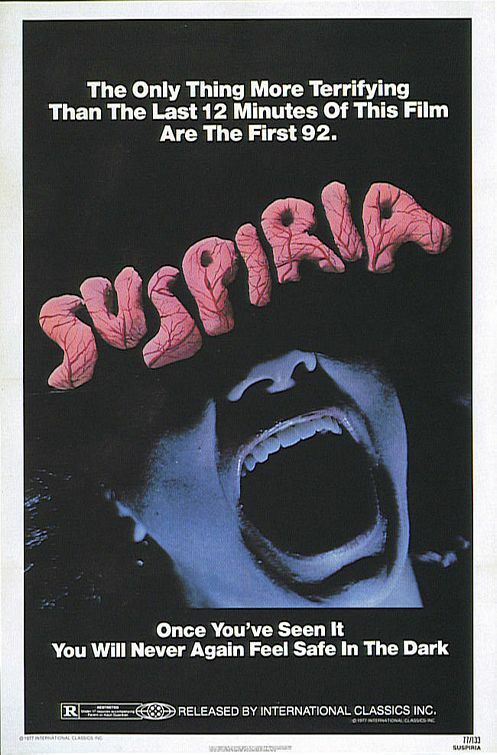 Receiving good notices and distribution across Europe and the US for his earlier work, Argento hit a new level of box office success with Suspiria when it arrived in 1977 . We were at the tail end of the paranoid and demon possession horror entries of the early ‘70s (like The Exorcist) and a year before John Carpenter’s landmark Halloween gave birth to the slasher film. The timing was perfect for a movie that straddled the line between popular film and art-house exclusivity. Along comes Suspiria , dripping with amazing visuals and several hair-raising passages. Arriving in Germany one rainy night, American Suzy Bannion (Jessica Harper, Minority Report) has come to study dance at the renowned Tanz Dance Academy which is run by Madame Blanc (Joan Bennett, 1950’s Father of the Bride). She’s barely made it to the front door when she sees a frantic girl running out of the academy into the darkness. We follow the girl as she seeks asylym with her friend, only to be stalked and elaborately slaughtered by an unseen creature. The next day Suzy begins her studies under the watchful eye of Miss Tanner (a devilishly manic Alida Valli) and soon begins to experience strange visions while people start to die horrible deaths around her. As Suzy investigates more into the origins of the academy, she begins to suspect it’s being run by a coven of witches who are more than willing to trim their student roster if anyone steps out of line. There are many unforgettable sequences bestowed upon us by Argento. From the opening kill to a spooky death in a shadowy courtyard, the master takes his time toying with the victim and us. An extended chase sequence that ends with the victim falling into a nest of barbed wire is satisfying but feels like it plays out in real time. It’s all accompanied by a downright eerie score from frequent Argento collaborator, The Goblin. Having seen multiple Argento films I know the director likes to proceed slowly and with precision, often to the exhaustion of the viewer. There are times when you’re wondering how anyone could fall victim to a killer that moves so deliberately but it’s all constructed with such elegance you have to admire the effort. 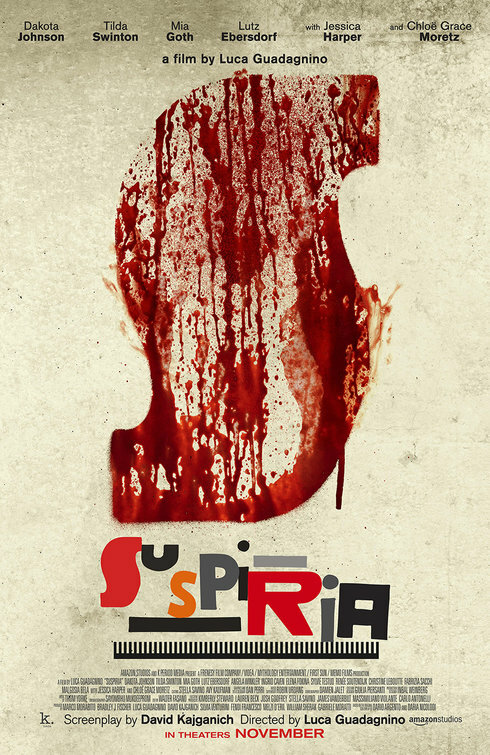 Narrative has never been Argento’s strong-suit and having seen the remake of Suspiria released in 2018 before re-watching this I see how simple his idea for the film is. There’s nothing too deep about what he’s trying to say and while the overall impact of the movie is profound it’s hard to argue there’s very little story to sink your teeth into. Even a late in the game cameo by Udo Kier (Downsizing) as a professor who provides information on witches to Suzy doesn’t fully resonate. Though Argento would receive critique throughout his career for not being overly kind to his female characters, there are several strong women in the film that are shown to have their wits about them. Harper’s wide eyes and general mousiness take her a long way in establishing her stranger in a strange country approach but her line delivery (even those that weren’t dubbed by her later) feels a little comatose. That stands in stark contrast to Bennett who speaks each of her lines without punctuation, pause, or purpose. She just sort of exhales and words happen to come with it. Most of the film was dubbed after the fact, creating some moments that are in sync and others that are way off. This was the first film in a trilogy of movies surrounding covens of witches that Argento imagined. The second, Inferno, came out in 1980 and the final, Mother of Tears, arrived without much fanfare in 2007. I’ve yet to see the final film but Inferno suffers from much of the same issues present in Suspiria – a lot of great looking visuals without a truly intriguing story. There’s no question Suspiria deserves it’s spot on the list of influential horror films in history and you should absolutely see it, just be prepared for a pretty exterior and a frustratingly hollow center.